DURHAM, N.C. — Former White House chief of staff John Kelly said he disagreed with some Trump administration policies — particularly on immigration — but dodged questions Wednesday about the president reportedly intervening to secure top-secret security clearances for his daughter Ivanka Trump and son–in–law, Jared Kushner. Kelly, in an appearance at Duke University, did not deny reports that President Donald Trump circumvented the usual process to grant the security clearances or that he later wrote a memo outlining his concerns about it. He simply said he believes any such conversations with the president would be privileged and that he’s not at liberty to discuss security clearances. It was a notable contrast to Kelly’s aggressive pushback on news reports while in the White House about his actions and relationship with Trump. On Wednesday he even stressed several times the importance of a free press. 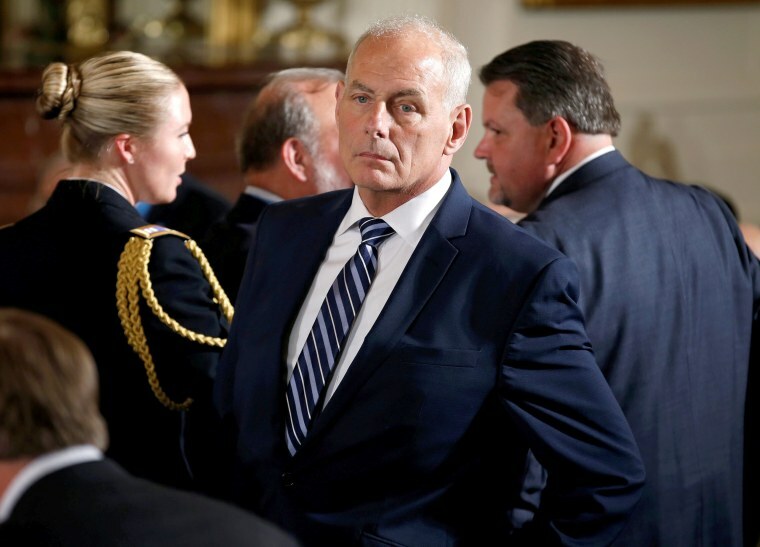 The wide-ranging question-and-answer session before several hundred people marked the first time Kelly, who left the White House at the end of 2018 after a rocky tenure, has publicly addressed the president’s role in his family members’ security clearances. “But it was he most important job I’ve ever had,” he said. On the administration’s handling of children at the southern border, he was critical, though he blamed then-Attorney General Jeff Sessions for catching the White House by surprise with the adoption of a “zero tolerance” policy. “Generally speaking I would always look for another way to do it,” Kelly said. Asked about Trump’s executive order establishing a travel ban just days after taking office — while Kelly was Homeland Security secretary — he said it was a mistake made by inexperienced White House staff who didn’t run the policy through the usual process-gathering process for input from relevant government agencies. The White House staff “got a little bit maybe out in front of their skis,” he said. When Trump tapped Kelly as his chief of staff the White House had little internal structure and was largely seen as chaotic. Kelly didn’t seem eager for the job and spent his initial weeks trying to install process and order to the West Wing. Despite reports by NBC News and others that Kelly saw himself as the “adult in the room,” he denied taking that view. “In my view everyone in the room was an adult,” he said.